Just finished! 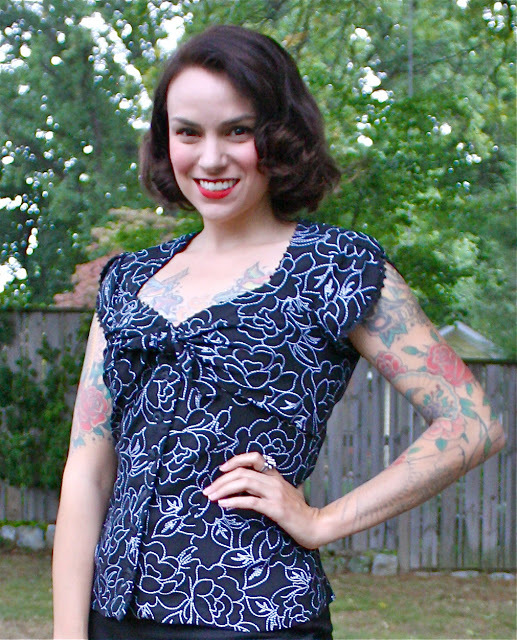 This is Butterick 6217 made up in one of my new fall fabrics. 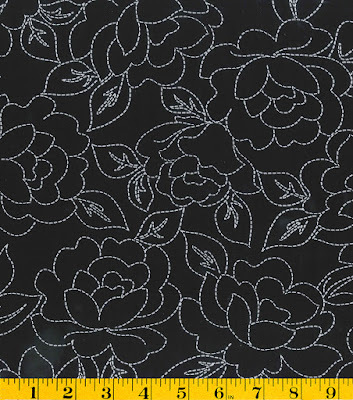 This is a rayon challis that has a rose pattern in little white stitches! 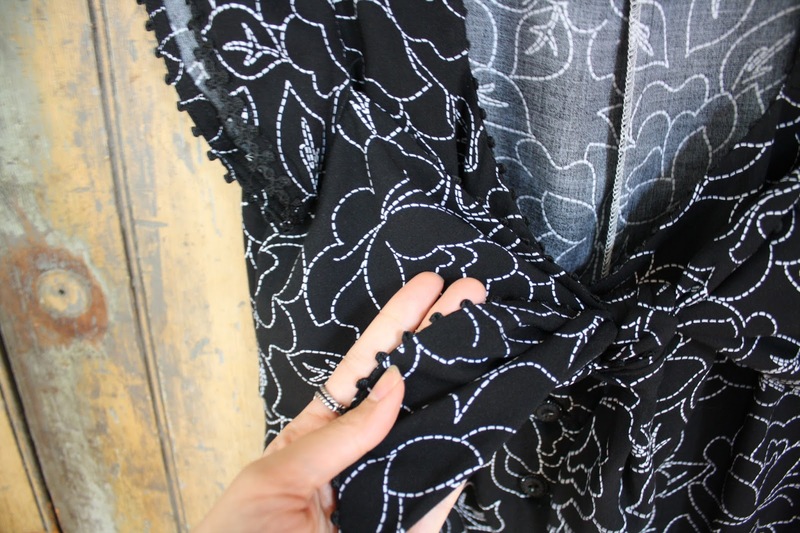 The challis is nice and drapey, making it a perfect match for this pattern. This is View A, which has a cute little bust tie and tulip sleeves. There are several other mix-and-match options. I used a narrow lace trim around the sleeve hems. 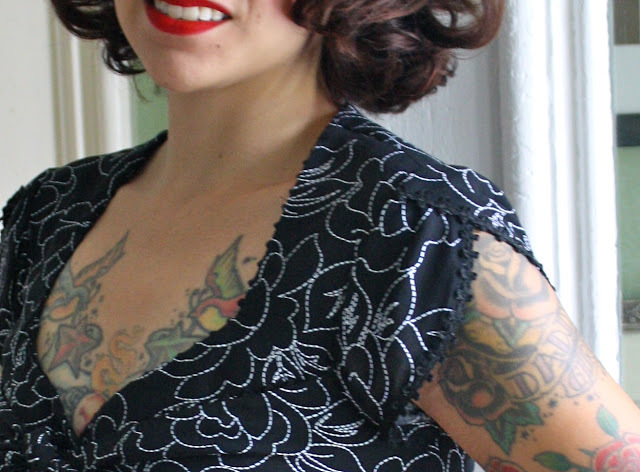 I used the same trim around the neckline, blouse fronts, and upper edge of the tie. 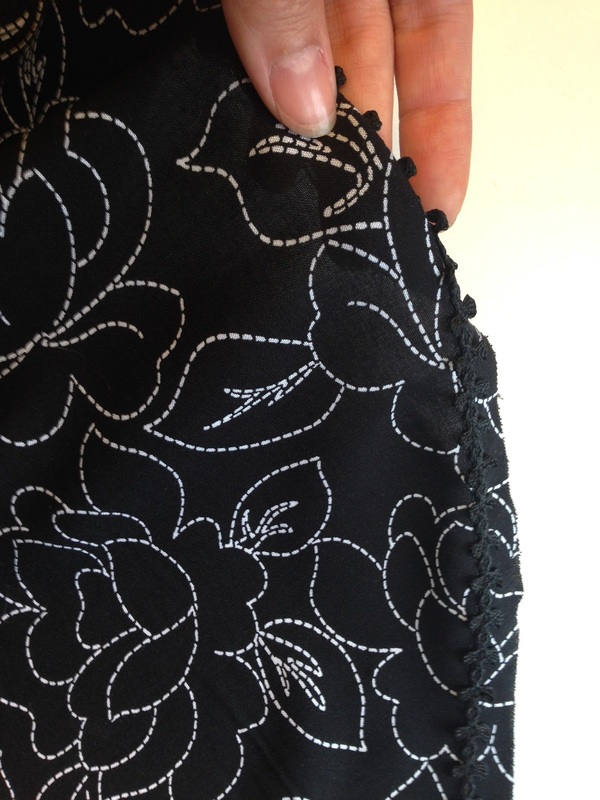 Instead of stitching it on flat here, I inserted it into the seams like you would with piping. Here's a picture of it stitched to the bust tie before the seams are stitched. Just the little bumpy side of the trim sticks out, making a really subtle effect. Here you can see the difference in the trim application on the sleeves and the ties. I lightened this picture so you can see the trim and the buttons a bit better. Black is tough! 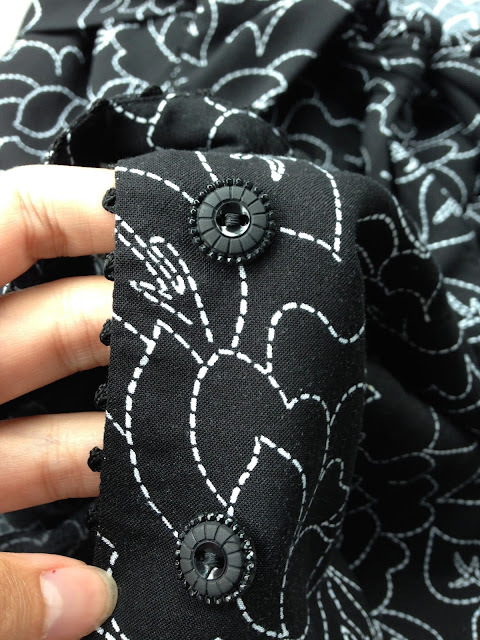 Here you can see the detail on the buttons, and the trim at center front. A great thing about this pattern is that it's quick. I think I spent about 5 hours from cutting to completion. It's also very flattering, though I would recommend sizing down if you want a fitted look. I'd normally be a size 12, but I made a size 10 here. If comfort is more important to you, make your usual size. I'm hoping to make a few more versions of this blouse. 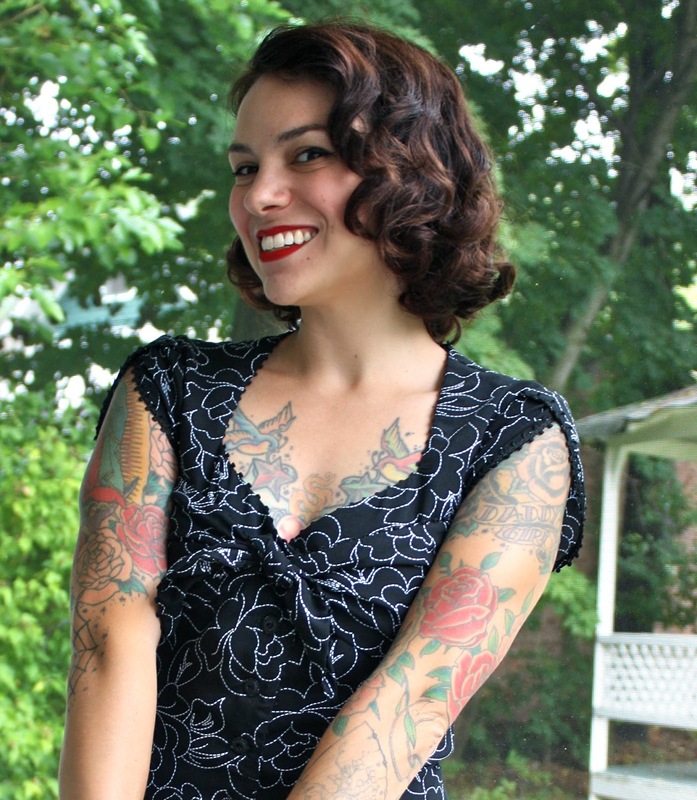 It looks great with or without the bust tie, and you can also make it sleeveless or with a short gathered sleeve. It also works nicely with pants or skirts, and you can layer it with a cardigan now that it's getting chilly out there. I made this one and I love the pattern so much! I can't wait to make more of them. So pretty! I love that fabric!! I love the tulip sleeves and the trim. I also like how you coordinated those buttons with the trim. They have a similar look. It makes me think of a Chanel skirt and blouse I saw recently in Vogue where the trim and the buttons coordinated so perfectly. I was really impressed with it and now also with yours. Doesn't Gertie always have the best shoes! Love the fitted design with the tulip sleeves! This is a beautiful top I may just try to make. Thanks for inspiring us with your creative designs! Love this blouse on you - it wouldn't suit a large busted woman like me I don't think - too much emphasis around the bust - love what you did with the trim! Brilliant inspiration with the trim that I just might copy in the future! There are times when that just looks so much prettier than piping :) Thank you for sharing your work! I love the details! The trim and the buttons are perfect together, especially with your new fabric! I just might have to make that top. But, I also LOVE the pants! Are those made from a pattern of yours? I love the braid finish! Thats a lovely touch. 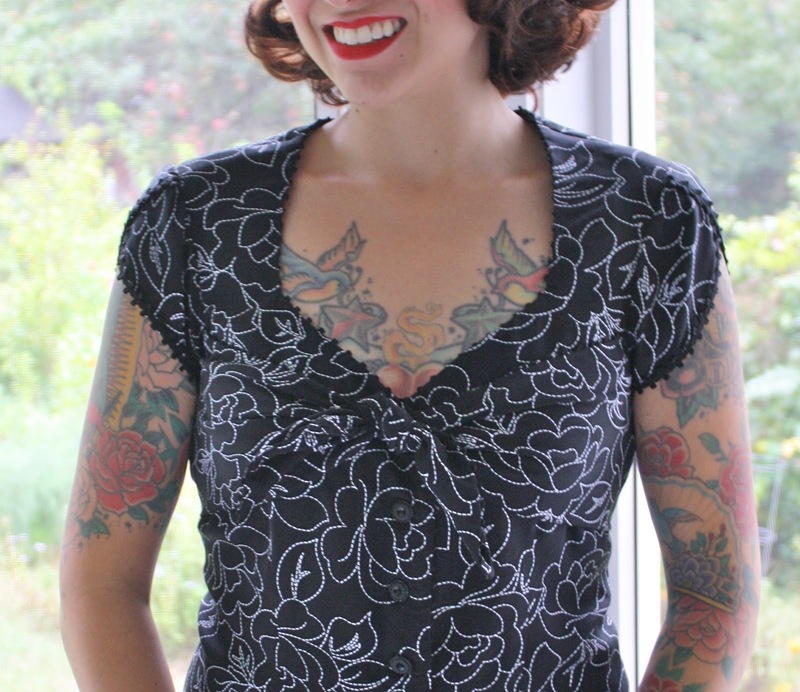 I may have to buy this pattern since View C is just the neckline I have been looking for. It looks lovely on you. Thanks for sharing. What a pretty neckline! I love adding trim to make a piece feel special. My last dress I added pom poms - not as subtle as your cute trim, but a similar idea. http://www.grayallday.com/dye-and-smock-the-butterick-6169/. Gorgeous, the pattern, your details AND your fabric! It looks soooo good on you! I am going to have to try this pattern! Love the lace trim! GORGEOUS! I Love this entire outfit!!!!! Super random question: what are your measurements? I have the pattern, I have fabric, I am just debating between sewing a 10 and a 12. We look to be about the same size. Also picking up that fabric at Joann's today!